I have been forwarded some critical comments about the argument I make in “Thinking Strategically About Free Speech and Violence.” The person making the comments did not intend to release them publicly, so to preserve anonymity I will refer to him as Professor Psmith. I think his reaction is probably not anomalous, though, and that his criticisms should be dealt with so that nobody accidentally ends up agreeing with them. This issue is important enough that I want to deal with whatever obvious objections people have. But Robinson ends by worrying that readers, who might be thinking of punching Nazis, would be “giving up” their principled commitment to “free speech” and “nonviolence” and should think twice before doing this. This is strange: personally, I do not have any commitment to a principle of free speech that says blocking talks is “intrinsically” or “in principle” wrong. 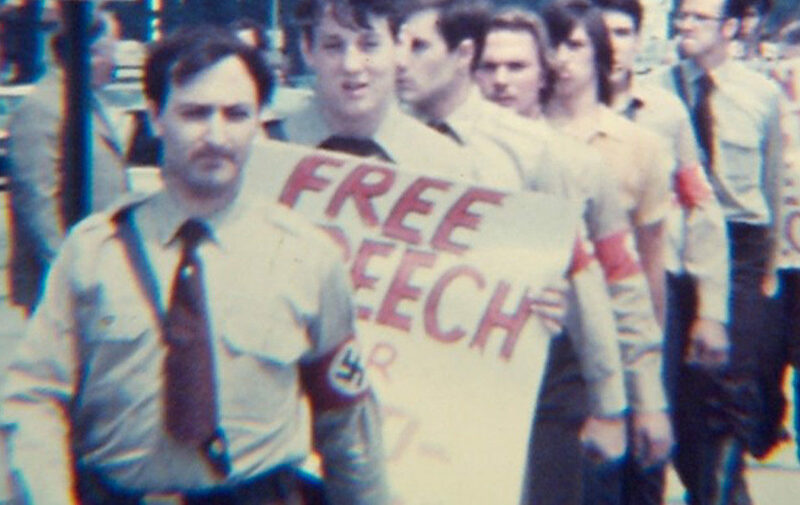 Free speech is always provisional and contingent. If you use your speech to incite against migrant or trans students, as Yiannopoulos did, I have no obligation to defend your freedom to do that. Likewise, fascism is a movement dedicated to the violent suppression of democracy. The use of violence against it comes from the tactical question of effectiveness. I am not contemplating “giving up” anything, then, because I do not have these principles. And if these are indeed issues of principle, if you are like Noam Chomsky who says Antifa are “wrong in principle,” why bother pretending you care about strategy? Finally: The far right has been growing for years. This began with the Tea Party. There is now at last an organized left wing response. The far right has increasingly been normalized. What is the evidence that Antifa actions, antifascist protests at Berkeley, punching Richard Spencer, are making this worse, rather than beginning to turn the tide in our favor? Now, let me deal with these points in considerable, possibly excessive, depth. First, it’s actually encouraging to see Psmith responding with these kinds of arguments. My main purpose in writing the original article was to force people who take his position to take the strategic debate seriously rather than treating it as automatically resolved in their favor. He’s doing exactly that, going through and conceding some points while disputing others. For example, he says we should focus on whether we have inhibited the growth of fascism, rather than whether we are coming off well in the media, and that I focus too much on media portrayals. But Psmith and I are now mostly in full agreement: as I said at the beginning of the article, the question should always be “Are we helping the Nazis?” Psmith and I may have a difference as to the importance of media (I might think it has a greater role in shaping public opinion, and thereby sympathy to fascism, than he does), and we can discuss that, but he has already conceded the entire main point of the article, which is that this needs to be a serious discussion about consequences, and that we need to talk about what is going to happen rather than what is justified in the abstract. Things have shifted, and now we’re seriously considering the possibility that Antifa are counterproductive, which is precisely what we should be doing and precisely what the article recommended. Psmith’s main actual difference with me is that I have presumed we are “giving up” a commitment to free speech and nonviolence, whereas he never had any such commitment in the first place. They are, he says, always “contingent” and tactical, and if you agree with Chomsky that obstructing speech is wrong in principle, why bother “pretending it is strategic” to begin with? To answer that particular question: nobody is “pretending” to care about the strategy question; principles and strategy both matter. One can have two separate inquiries. Is there a principle that obstructing speech is wrong? And is obstructing it a good way of achieving the left’s goals? And those can theoretically be answered separately, though if you’re a strict consequentialist the answer to latter will determine the answer to the former. So I could agree with Chomsky that it’s wrong in principle, but also think that it’s a poor way of achieving the left’s goals, or I could think that it’s wrong in principle but is effective. (To see why these are separate: I might think that murdering Richard Spencer’s family would be an effective way of neutralizing him as a leader—nevermind why. But I could still conclude that it was wrong in principle, because I am, say, a Christian who does not believe in murdering innocent people.) Psmith says, well, if you believe it’s wrong in principle, why even bother having the strategic discussion? And the answer is: because individual principles aren’t absolutes, and I also care about whether the left achieves its goals, and if something violates a principle but is good strategy, you may have to consider doing a thing that goes against your values because of the outcome it achieves. Chomsky said Antifa was wrong in principle and wrong strategically. That means “Even if you disagree with me about whether it’s wrong in principle, you should listen to me about the strategy,” because we both want the left to achieve its goals. In the parallel scenario, here is the equivalent: I say that I believe liquidating Richard Spencer’s family is wrong both in principle and strategically, i.e. it both violates my belief that you shouldn’t kill innocent people and it will lead to the rise of fascism, which I also oppose. You reply “Well, I don’t think it’s wrong in principle, because I don’t care about nonviolence and I’m not a Christian.” I say “Well, as I say, it’s also a strategic disaster, and we both care about that.” You, the Psmith of this exchange, reply: “Why are you pretending to care about strategy if you think it’s wrong in principle?” And the answer is, “I’m not pretending. I care about both my moral values and strategic concerns, and I’m talking about the strategic part of it because you don’t share my moral values! And I don’t just care about whether you violate my nonviolence principle by murdering innocent people, I also care whether you enable the rise of fascism through counterproductive strategic measures. There are bad things and worse things.” A Wrong Principle with a Bad Outcome is even worse than a Wrong Principle with a Good Outcome. Psmith assumes that things labeled “moral principles” are automatically absolutes, i.e. that once a person has a moral principle of nonviolence, no amount of strategic necessity will cause you to endorse a violent tactic. But that’s actually not how most people’s moral principles work. Consider Martin Luther King. King was opposed to violence both morally and strategically. Psmith could say to King “Your discussion of the effectiveness of nonviolence is in bad faith, because you’d actually oppose violence no matter what.” First, of course, an accusation of bad faith isn’t actually relevant to the question whether violence is strategically stupid. Second, even King wasn’t an absolute pacifist, but a pragmatic one. He abhorred violence, but he didn’t say pacifism should be adhered to no matter how great the harms it caused, that you should let five billion people perish rather than striking someone. If the strategic necessity were great enough, it might outweigh the principled opposition to the use of violence. Fortunately, King never had to deal with such a dilemma of principle v. strategy, because he believed the strategy question and the principle question happened to be in harmony, because violence was futile. You could argue that his personal hatred of violence probably affected his strategic assessment, and that’s true. But that still doesn’t mean he didn’t care about strategy; if you had proved to him that violence was going to be an extremely effective means of getting the Civil Rights Act passed, and that nonviolence was certain suicide, I am sure he would have agonized over the tension, because (like pretty much everyone else in the world) he cared about both accomplishing things and following his principles. Having a “moral principle” just means assigning a strong weight to a certain consideration, not that that consideration automatically trumps all others. As to this question of whether the left would be “giving up” free speech and nonviolence, and the principled reasons for believing in them. First, Psmith says “I don’t share a commitment to any version of free speech that says blocking talks is intrinsically and in principle wrong.” It is, he says, “provisional” and “contingent.” Again, I think Psmith misunderstands what people like myself mean by “in principle.” What we mean is not that it is always wrong to block talks; one can always conceive of a situation in which it would be justified, which means there’s no contradiction between “in principle” and “contingent.” What we mean is that it is important to have “let everyone speak and don’t shut them down” as one of your most important values. You still have other values, though. “Don’t let people get hurt” is another value, and it may be that in a particular scenario, when you put “Don’t let people get hurt” next to “Let everyone speak,” the speech is so harmful that you have to shut it down. But it’s important that you do have “Let everyone speak” as a value, and not just “Don’t let people get hurt,” because if you don’t, then any amount of possible risk of hurt would justify suppressing someone’s speech. There’s a very pragmatic justification for making sure you at least have some principled commitment to letting people speak: if you don’t, you’ll shut down anything. Of course, every value is “provisional” and “contingent” in some sense, insofar as unless one is a fanatic, there are always situations in which one principle might have to yield in order to uphold another principle. But the crucial thing is: don’t ditch free speech as one of your central values, and don’t just default to shutting down speech, because otherwise you’ll just license yourself to censor anything, which is a recipe for disaster. This is as true at private universities as it is in the realm of state action. If the rule is “Any student club can bring anyone they like to speak on campus,” that protects the most dissident and radical groups, which hopefully we’ll be in. The more “contingent” we make this, the less robust it is. Of course, here we tend to get the “private action” argument. Okay, we’re not asking our universities to shut down events, or the government, we’re just saying that we’re going to shut them down. Now first, it’s important to note the concessions: we do agree that we want to make sure that institutions themselves don’t curb speech (meaning we’ve already conceded it’s important as far as institutions go, because of the disaster that occurs with handing authorities more regulatory power over expression). But then, as I have written elsewhere, this too ends up being difficult to find a limiting principle for. Okay, we only shut down fascists. But is anyone who supports Trump a fascist? Okay, we only shut down war criminals. What about everyone who voted for the Iraq War, a criminal atrocity that killed 500,000 people? Soon things are looking very “contingent” indeed and the entire idea of an “open forum” has become a joke. You’re adding exception after exception until even Germaine Greer is too toxic for campus. The question here is always what kind of contingency, and who will make the determination. This is one of the central points in my article and it’s always one that opponents of free speech evade dealing with seriously, believing that highly abstract and imprecise terms can somehow solve the practical problem. The principled justification for an open forum, one that has few exceptions as possible, is easy to see. If we don’t listen to other people’s ideas, we will never know whether we’re wrong. If our ideas are the only ones that should be heard, we are assuming ourselves infallible. Open discussion among people with strongly differing viewpoints is a crucial value, because that’s how human beings learn from one another. Now, you can leap in here and say “Nazism is not just a ‘differing viewpoint’!” But I’m not saying that it is, I’m explaining what the value is that we’re trying to get at. The reason you might not want to ban Nazis is different: it’s because your Nazi ban may end up eroding the forum itself, for the reasons just stated. But there’s a perfectly good reason why we would want, to the extent that we can, to value free speech. We should value it especially as leftists, who believe that people are supposed to be as free as possible. What about nonviolence? Again, of course it’s contingent. But the hatred of violence seems to me fundamental to being a moral human being. Sometimes it’s necessary, but it’s always horrible. This is a moral conviction, so it’s impossible for me to argue the point with someone whose feelings on violence are dependent entirely on its strategic necessity. But I believe that since leftists want to see a world without suffering, abhorrence of violence is important. And frankly, I am not terribly comfortable being political allies with someone who doesn’t have a deep hatred of violence, because I am worried that if you enthusiastically embrace the “it depends on the circumstances” logic without having your judgment tempered by a revulsion toward pain and suffering, you will end up (as so many leftists have) breaking a million eggs in the service of your ever-more-distant omelet. Finally, Professor Psmith says: “The far right has been growing. Initially, there was no organized response. Now there is. What is the evidence this is making it worse, rather than turning the tide?” But notice that the same observation could be used to ask the opposite question. “The far right has been growing. Leftists have organized a response. The far right continues to grow. What is the evidence that this is turning the tide, rather than making it worse?” It should be clear that there’s no conclusive evidence for either position. For him to say “What is the evidence it’s making it worse” and assume that in the absence of such evidence, we ought to believe it’s making it better, is as unjustified as if I said “What is the evidence that it’s turning the tide,” and when he can present none (because “the beginning of a turning tide” is difficult to prove), I conclude that it’s making it worse. It’s incredibly difficult to answer the question of what causes what. In fact, it’s probably impossible: if the left organizes a bunch of nonviolent direct action, and then there are also some antifa beating Nazis, and the left begins to win, the facts are consistent with the conclusion that antifa helped or that they impeded progress you would have otherwise made. The truth is: I don’t know the answer and Psmith doesn’t know the answer. And the entire point of my article was that because we don’t know the answer, we need to be very cautious and examine the question carefully. He says that the correct inquiry is into whether we are causing the fascists to grow or shrink. I totally agree. But until he produces some good reasons to believe that making free speech and nonviolence more “contingent” will make the fascists go away, I’m going to share Noam Chomsky’s skepticism.